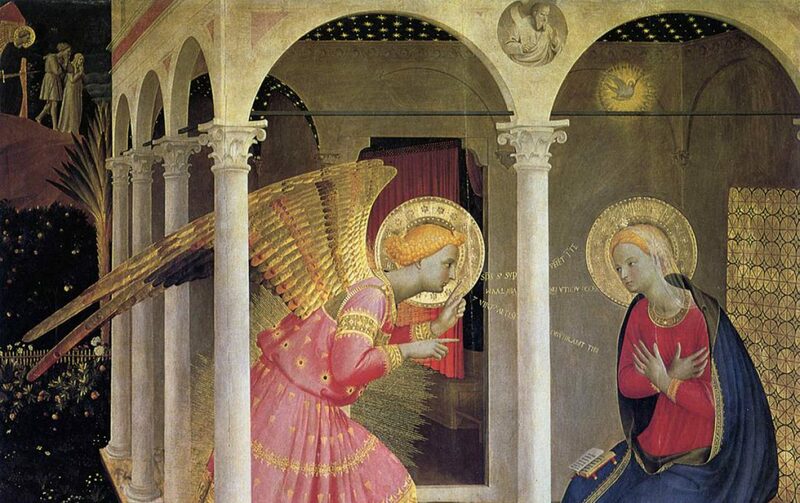 The Isabella Stewart Gardner Museum in Boston, Massachusetts is the only venue in America for the extraordinary “Fra Angelico: Heaven on Earth” exhibition. This amazing collection of reliquaries which express the life of the Virgin Mary, and other paintings of the greatest painter of the Early Renaissance, will be on display until this Sunday May 20th, 2018. Earlier incorrect media reports had the last day as May 28th. I will be posting my photos of the Gardner Museum’s exhibit starting with this post and continuing on through the upcoming weeks and months. The exhibit consists of more than just the exquisite four reliquaries and it will be my pleasure to bring to you my photos of all of it. I am grateful to the Isabella Stewart Gardner Museum for allowing me to take photographs of the exhibit. I will proceed with the first photo showing the image that you see as you climb the stairs of the Museum to the second floor where the exhibit is located. That image is of the Assumption of the Virgin Mary, surrounded by angels as she ascends in a vortex-like movement, toward God the Father. The reliquary containing the complete image was acquired by Isabella Stewart Gardner in 1899. This is the first time in history that all four reliquaries are reunited since they were split up and acquired by collectors and museums around the world. My wife and I were privileged to visit the Museum and exhibition last week. Words cannot describe the restored reliquaries and paintings in this display. I am not embarrassed to say that at one point I was choked up with emotion as to the beauty, technical skill, narrative brilliance in explaining Sacred Scripture, and the theological depth that Fra Angelico expressed in these sacred images. Beato Fra Angelico (birth name Guido di Pietro) was a Dominican friar and known by his religious name as Brother John of Fiesole. The first historical record of Fra Angelico as a painter is the 1418 record of payment for a painting commissioned by the church of Santo Stefano al Ponte in Florence. Fra Angelico is believed to have been born in the late 1390’s and died in 1455. He is buried in Rome at the church of Santa Maria sopra Minerva. He was beatified (beato) by Pope Saint John Paul 2 on October 3, 1982, and in 1984 the Pope declared that Fra Angelico was the patron of Catholic artists (that is why I named this blog after him). Beato Fra Angelico’s feast day is celebrated every year on February 18th. As you come up the stairs leading to the second floor of the Museum and turn the corner you first see an enlarged version of Fra Angelico’s Dormition and Assumption of the Virgin located below. This image is showcased because it is found within the reliquary acquired by Isabella Stewart Gardner in 1899. This enlarged version of the Virgin Mary is found within the reliquary, and is its centerpiece, seen below. The above outer frame and base, which contains Fra Angelico’s painting, is known as a reliquary. A reliquary is a container which holds the relics (bones, hair, etc) of deceased holy people or declared saints of the Roman Catholic Church. The reliquary allows the faithful to venerate, not worship, the life, deeds, and mortal remains of the person whose relics it contains. Fra Angelico painted the four reliquaries’ images specifically for the church of Santa Maria Novella in Florence between the years 1424 through 1434 The painting is rendered in egg tempera, oil glazes, and gold. It is simply stunning. There is another separate painting in the exhibit which concentrates just on the dormition of the Virgin Mary. I will show that to you in the next post. The “Heaven on Earth” exhibition is made possible with the support, in part, by the Robert Lehman Foundation and the Massachusetts Cultural Council (the Council receives its funding from the State of Massachusetts and the National Endowment for the Arts). The media sponsor is WBUR in Boston. The Museum’s Executive Director, chief conservator, curators, conservators, and support staff brilliantly provided the technical expertise and planning for this exhibit. The companion book, edited by Dr. Nathaniel Silver (with contributions by more than ten experts) is also very well done and a worthy addition to your library. Photos and text © Deacon Paul O. Iacono 2011-2018. Thanks again to the Isabella Stewart Gardner Museum for this beautiful exhibit and enabling the public to enjoy, be edified, and to take photos of it. Yesterday, March 19th, Catholics happily celebrated the Feast of St. Joseph. Today’s post is slightly different from those previous in that it will discuss an Italian pastry in relation to a symbol found in Catholic sacred art. We are breaking new ground here! A little history is in order. In the 1800’s, a creative baker in the city of Naples, Italy made, for the first time, a pastry known as the zeppola (plural, zeppole). Through the years other areas created this delicacy, too, such as the islands of Sardinia, Sicily, and Malta. This traditional pastry travelled with the Italian immigrants to America and Canada, and, I am happy to say that it continues, and finds its apogee, in the southern New England area of America. But first things first. This blog normally talks about Gospel truths, Catholic and Orthodox sacred art, iconography, the relationship of art to Catholic prayer, saints, etc. This is my first venture in discussing pastry cuisine (! ), but, in this case I think it is important. Why? Because in my opinion, the noble zeppola reflects a Catholic religious symbol. Obviously I am not sure the original baker (Pasquale Pintauro from Naples) desired to reflect this in his magnificent creation, but, in my opinion, it is there. More on that in a moment. First, a quick overview of the artistic symbolism associated with St. Joseph. Many sacred images of St. Joseph either alone, or with the child Jesus, usually has him holding a rod with a flower or flowers at the top. In one hand he holds the rod, in the other, he is holding the child Jesus next to his chest. A simple example of this is found in the statue below. There are variations of this basic model and many portray the artistic emotion and sentimentality that was popular during times past. Yet, what does the symbol of the rod mean? Does it have any basis in history? What does it have to do (in my opinion) with the noble zeppole? Catholic tradition in this matter starts with Jewish custom. Rev. Maurice Meschler, S.J. describes the legend associated with this image in his excellent book on St. Joseph. He mentions that an ancient book entitled De Ortu Virginis, explains an occurrence in the city of Jerusalem in the first century AD, he writes, “...the Jewish priests in accordance with a special revelation received from the Holy of Holies in the Temple at Jerusalem, are supposed to have ordained that, in a manner like the one in which Aaron had been chosen by God to be high priest of the Temple, all the young men of the family of David were to place a branch or a rod on the threshold of the Holy of Holies; and the one whose rod should become green and blossom, and upon which the Holy Spirit should visibly descend, was to be the spouse of the most Blessed Virgin Mary. St. Joseph alone, whether from a motive of humility or love of virginity, did not present his rod; and thus no decision was arrived at. When the priests had instituted an inquiry into the affair, God answered that the rod of a man of the family of David was still missing. Joseph therefore [because he possessed the virtue of obedience] brought his rod, and lo! it blossomed. The Holy Spirit descended upon it, and Joseph became the spouse of Mary. It is for this reason that Saint Joseph is often depicted with a blossoming rod in his hand, while upon its crown, even in very early representations of art, rests the Holy Spirit.” Rev. Meschler explains in his chapter on the espousals of Joseph and Mary that the sacerdotal purpose of their mutual virginity sealed the marital bond between these two people, chosen by God, to be instruments of His work in redeeming His creation. So what does that have to do with custom of eating zeppole on the Feast of St. Joseph? It is my opinion that the 19th century Neapolitan baker, Pasquale Pintauro, would certainly have known of the symbol of the flowering rod held by St. Joseph, after all he would have seen it in churches and statues found throughout Naples. With this in mind, the creation of the zeppole pastry was his way of expressing the branch or rod and flower portrayed by sacred artists. This is especially seen in its presentation by a Rhode Island bakery by the name of DeLuise (it is found on Oaklawn Avenue in the city of Cranston and on Chalkstone Avenue in the capital city, Providence. By the way they make the finest zeppoles in southern New England. We drove down from Massachusetts to buy them at the Cranston store). Notice the photos below of the mini zeppole I happily consumed last night. So, here comes my critical analysis (! ): the rough textured spiral side represents the branch or the rod of the family line of King David. The red cherry on the top of the pastry indicates the descent of the Holy Spirit which is represented by the miraculous flower. The cream filled center represents that the unique family line of King David would again flower – and be fruitful – through the power of the Holy Spirit in the Incarnation of Jesus Christ. The desire of God to redeem His creation was made possible because of the care of His Son, as a babe and youngster, by Joseph and Mary – both members of the Davidic family line. Every year on March 19th Catholics throughout the world celebrate this fact by consuming the noble zeppole – the the staff and flower – of the Feast of St. Joseph . Thanks for reading! It was fun to write, but even more joyful to eat! Copyright © 2011- 2018 Deacon Paul O. Iacono All Rights Reserved. Photos of the zeppole by the author. May the Peace of Christ be with you on this unique day in the history of the Roman Catholic Church. Today we commemorate the memorial of Our Lady of Lourdes which reminds us that the Virgin Mary appeared to St. Bernadette in 1858 at Lourdes, France. Her message was clear and concise to the young Bernadette: “I am the Immaculate Conception.” She requested Bernadette to tell the local clergy that a church should be built on the site of the apparition so that the sick and suffering might come to find comfort, and healing of both body and soul. A beautiful church was built, and on a yearly basis hundreds of thousands of people come to Lourdes to be in prayerful union with the suffering Christ and His Immaculate Mother. John Paul 2 in his later years provided a great witness to the nobility of the elderly since he modeled for us the suffering Christ. His successor and close friend, Pope Benedict 16th, has also given us the witness of a man who silently suffered many troubles while valiantly leading the Church and protecting its traditions and spiritual truths. With the news this morning of Pope Benedict’s announcement of his planned resignation on February 28th the Church has entered a transitional period which has not occurred since Pope Gregory 12th resigned the papacy in 1415. It tells us that the Holy Spirit continues to guide the Holy Catholic Church. Christ is the Head of the Church and we, faith-filled clergy and laity, are its Body. The papacy, originating with St. Peter, has provided the Church with the leadership that was and is required in any continually maturing and growing institution. The papacy has, at times, been on a roller coaster ride of popularity, yet, throughout the two thousand years of its history it has never done anything to confuse or limit the truths found in the revealed word of God or the Traditional faith and moral teachings of the Church itself. People may like the personality or find the historical stance or perception of one pope more acceptable than another, yet, if one truly looks at the history of the papacy, without the proverbial axe to grind, you find an institution based in the humanity of Jesus Christ giving Peter “the Keys to the Kingdom” (Matthew 16: 13-20) and which continues to be guided and protected by the wisdom of the Holy Spirit. That wisdom guided, and continues to guide, Pope Benedict 16th, for his decision to resign his office speaks volumes about his understanding of the virtues of humility and patience. Humility, in that he understands that owing to his age and physical condition, it is right to turn over the chair of Peter to another man; and patience, in that he knows (and lovingly trusts) that the Holy Spirit will patiently guide the Cardinals to select a new pope who will continue to lead the Church with love and fidelity to Christ and His teachings. We wish Pope Benedict 16th well and pray for the continued blessings of the Holy Trinity to be with him. We thank him for his great gifts of teaching, scholarship, and leadership to the Church over the long history of his service to us as deacon, priest, bishop, cardinal, and pope. We must continue to remember him in our prayers. http://www.catholicleague.org/ just posted a wonderful summary of the Legacy of Pope Benedict 16th, I have reposted it below for your edification. Religion for Pope Benedict XVI is as much a public issue as it is a private one. He knew religion could be abused, leading even to violence. His much misunderstood 2006 Regensburg University lecture was really about the uncoupling of religion from reason (reason not united to faith also leads to violence). The pope reached out to dissidents on the right and the left, seeking to bring them to communion. Not all his efforts succeeded, but his attempts were noble. Addressing those who still blame Jews for the death of Christ, the pope settled the issue with authority by pointing out that no one should be blamed since, as he argued, the crucifixion was necessary for God’s plan of universal redemption. The pope’s many references to what he called “the dictatorship of relativism” were a constant reminder that one of the greatest threats to freedom today is the abandonment of the search for truth. In this morning’s selection from the Office of Readings in the Roman Breviary, the Venerable Bede, an English monk presents a beautiful analysis of Mary’s joy-filled song – The Magnificat. In 1899, Pope Leo 13th made Bede a Doctor of the Church. Bede was a skilled translator, linguist, and writer. His ability to compose insightful spiritual essays, and skill in making the writings of the Early Church Fathers accessible to his fellow Anglo-Saxons, significantly contributed to the growth of Roman Catholicism in England. Let us take a moment today to dwell upon one of his perceptive and rich essays on the Blessed Mother. In the selection below, Bede provides us with a beautiful essay on Mary’s response to the knowledge that she will be the mother of the Savior. Her poetic song is known as The Magnificat, and it is said in the presence of her cousin Elizabeth (and possibly Elizabeth’s husband Zechariah) when they rejoice in the knowledge that they are both pregnant (The Visitation). Mary’s song of joy, faith, and trust is here separated by Bede and some of its key phrases are analyzed by him for our prayerful consideration. Mary’s words appear in bold italics, Scriptural references are in plain italics, Bede’s are in regular print. The entire Magnificat can be found in the first chapter of the Gospel of St. Luke, verses 46 – 55. Mary said: My soul proclaims the greatness of the Lord, my spirit rejoices in God my Savior. He has come to the help of His servant Israel, for He has remembered His promise of mercy. The promise He made to our fathers, to Abraham and his children for ever. “This does not refer to the physical descendants of Abraham, but to his spiritual children. These are his descendants, sprung not from the flesh only, but who, whether circumcised or not, have followed him in faith. Circumcised as he was, Abraham believed, and this was credited to him as an act of righteousness. Beautiful words and images to bring us into the eve of Christmas. May you all have a holy and joy filled Christmas day and good fortune in the New Year! You are in my prayers. Copyright © 2012 Deacon Paul O. Iacono All Rights Reserved. Notes on the paintings: The first sacred image is a contemporary sacred image written/painted in the iconographic style; I do not know its author. The second sacred image of Mary lost in ecstasy as she sang The Magnificat, was completed by James J. Tissot, a French painter (1836 – 1902). This painting currently hangs in the Brooklyn Museum. The medium is opaque watercolor over graphite on gray woven paper. It is approximately five by ten inches in size. Bede’s commentary is taken from The Liturgy of the Hours, Volume 1. Catholic Book Publishing Co., New York, 1975, page 362. Zechariah was a priest, and on that day – by lot – it was his turn to enter the chamber within the Temple called the Holy Place and burn incense on the special altar. The Holy Place was a small chamber that led to the Holy of Holies, which housed the Ark of the Covenant. For whatever reason, Zechariah that morning carried his disappointment with him into the Holy Place; and while he was there the archangel, Gabriel, appeared on the right side of the Altar of Incense. Gabriel tells Zechariah not to be afraid and that his prayer was heard before the throne of God. Gabriel continues with the joyous news that Elizabeth will bear a son, and that he will be called John – which in Hebrew means – “the Lord is gracious.” This child will grow and be great before the Lord, and even from his mother’s womb – he will be filled with the Holy Spirit. But, in a typically human way, Zechariah questions the archangel’s announcement. His query must have been different in tone. It must have had the typical masculine attitude of “Are you kidding me!” Zechariah’s tenor makes Gabriel, and possibly God, indignant – and Zechariah is struck speechless for his insolence. In Scripture, few lines later, we see Gabriel’s announcement to Mary. She questions him, too, as “How can this be since I do not know man?” But Gabriel does not strike her speechless. We have to be struck by this difference. What does it teach us? It is clear that God knows our hearts. God knew what was on Zechariah’s heart when he was in the Holy Place. Zechariah does not trust the message or the messenger, and by inference – he does not trust God. God knows his heart; and disciplines this good man. Like Zechariah, we, too, may disbelieve God. In our sophistication or position in life we may say “Well that’s fine, but, the Scriptures don’t apply to our situation, or this specific teaching was acceptable years ago, but, too much time has passed and it doesn’t apply to my problems. The Gospel says that Zechariah and his wife were good and righteous people. It was mentioned that he kept all the Commandments and ordinances. Yet, when his big moment comes – where is all that goodness and righteousness? It might still be there in his heart, but, there was also a pocket of doubt – a crevice of skepticism – that was significant enough for him, as a priest of the Almighty God, to be struck speechless in punishment for not trusting Gabriel’s message. As sacred artists, as Christians, this Gospel asks us to stop, and check our souls in this last week of Advent. It asks us how patient, confident, and trusting have we been of the Lord’s message to our hearts, and have we allowed this to carry over into our actions? Have we become more interested in all the hype about the end of the world from a pagan culture, or, have we trusted in the Word of the Lord and His messengers? Zechariah learned the hard way that when the Lord prepares us for His coming He desires us to be alive, awake, and alert to His call and to trust His message. So, our prayer in these last days of Advent should echo that of Zechariah, who in the months of speechless waiting, most likely in his mental prayer said, “Lord, I believe; cleanse me of my disbelief. Lord, I trust, heal me of my distrust;” and it should also echo that of Mary – who in humility and expectation waited patiently for the graciousness of the Lord to take fruit in her womb. In the same year as this Marian apparition, rebellion and protest against the Latin Rite of the Catholic Church was sweeping Germany, France, and England. While millions of people were leaving the faith in Europe, the Blessed Mother, through the miraculous image that appeared on Juan Diego’s tilma, convinces millions of people to enter the Catholic faith in Central America. As the European rebellion was tearing down millennia of Church theology and sacred tradition, Our Lady was building up the understanding of both the Spanish clergy in Mexico and the Native American population of the love of God and the assurance of her compassion and protection. You probably know the rest of the story. The Bishop is told of this event, disbelieves Juan Diego, and then the bishop asks for a sign. Juan Diego reports back to Mary and is told by her to cut the Castilian roses that are growing and put them in his poncho which is called a tilma. The tilma is opened in front of the Bishop and other witnesses, the roses fall out, and the miraculous image of Our Lady appears on the tilma. But is this story true? 1) The extraordinary conversion of multi-millions of Native Americans, and the Aztecs in particular, who, as a blood thirsty civilization, were known to kill as many as 20,000 human beings in one day to appease the blood lust of their primary god. 2) The roses that Juan Diego cut were native of Damascus, Syria, and did grow in Spain, but were unknown in Mexico at that time. 3) The tilma, or poncho, that Juan Diego wore was made of the agave fibers traditionally used by the Native Americans. These fibers were a natural substance that should have deteriorated within 35 years, and yet, today, the 481st anniversary of the event – this tilma is still in excellent condition. 4) Through scientific analysis done over the last forty years, it has been determined that the pigments used on the tilma are not of natural or man-made material, and there is no glue or sizing on the tilma to fix the pigment in place. Plus the colorization or iridescence of the image on this “icon not made with human hands” would not have been able to be produced by a human artist in the 16th century. This iridescent effect would have been seen only in nature. 5) Our Lady is represented in the colors and dress of a pregnant Aztec princess. Modern astronomical research has shown that the stars on Our Lady’s image are in the configuration of the stars in the heavens on the nights of the apparition in 1531. 1) You see, Our Lady came to the Mexican people – as she comes to us this Advent season – as a pregnant young woman who is promoting life and her protection – not only for her unborn child – but for all of us. 2) Our Lady calls to us through this icon to stress that she loves us, has compassion for us, sees our tears, and desires to offer us her love and comfort. 3) As the Mother of the incarnate Son of God she also points to her Son, and desires a church to be built so He can be properly worshipped, the people receive His graces, and so she can be there to assist us in our prayers to God. 4) Mary has always reminded us that He is the One, True, All Powerful God who desires our love, respect, and obedience. And as the Book of Revelation tells us, God has found Mary worthy to crush the head of the Serpent. All praise, honor, and glory be to God! And may the Blessed Virgin’s love help transform us into the image of Christ. Amen. (1) From a report by Don Antonio Valeriano, a Native American author of the 16th century; as published in the Supplement of the New Feasts and Memorials for the General Roman Calendar – The Liturgy of the Hours. (2) “Science Sees What Mary Saw From Juan Diego’s Tilma” Zenit News Service, 2001. We are about to begin the second week of Advent and as you may know the word Advent has its root in the Latin word adventus which means “coming.” The liturgical term adventus is similar to the Greek word parousia which refers to the Second Coming of Christ at the final judgment of the world. Through the millenia Church scholars have linked these two words together because they hope to instill within us the understanding that we are on a spiritual journey. In this journey we experience the waiting period – the longing – for the coming of Jesus, the actual birth of Jesus, and then, we again experience the waiting time for His return at the Second Coming. As part of our preparation for the great solemnity of Christmas, the Catholic Church, in both the Western and Eastern Rites, remembers the significance of Mary’s immaculate purity as being a necessary part of this entire spiritual journey. For in her humble “Yes” to the invitation to be the Mother of the Messiah, Mary becomes the New Eve – the mother of Jesus – and the Mother of the Church. Our sacred Tradition tells us that Mary was the daughter of Saints Joachim and Anne. They were devoted Jews who raised their child to be loyal and pure within the Jewish holy tradition. Mary was born within the royal line of King David and was betrothed, and later married under Jewish law, to Joseph, a respected Jewish carpenter from Nazareth. Little is known of Mary’s day-to-day life other than the references to her in the Gospels. Those early references indicate that she was a loving, concerned, and devoted person. During her Son’s ministry she attended the wedding feast at Cana, was present at Jesus’ crucifixion, and was most likely with the Apostles at the coming of the Holy Spirit on Pentecost. As the mother of Jesus, and the wife of Saint Joseph, Mary is the greatest saint. She is the model of faith, purity, and maternal devotion for all Christians. Mary is called the Blessed Virgin because our Sacred Scriptures tell us that she conceived Jesus by the power of the Holy Spirit, so Saint Joseph is the foster father, not the biological father, of Jesus. To become the mother of the Savior, Mary was “enriched by God with gifts appropriate to such a role.” (Lumen Gentium). Mary freely gave herself to God with complete trust even in the face of possible confusion about what was happening to her, and she freely responded and consented to God’s Will for her life. Mary’s “Yes” to God’s request that she become the Mother of the Incarnate Son of God, Jesus, enabled our Redemption to occur. What is the Dogma of the Immaculate Conception? The Church teaches that Mary was conceived without sin. This is the Dogma of the Immaculate Conception which we celebrate on December 8th of every year. This Solemnity explains to us that Mary received from God a special grace which is known as Prevenient Grace. Prevenient Grace is a “grace that comes before.” This means that prior to Mary’s biological conception, God decided that in His plan for salvation history He needed a totally pure woman to be the New Eve – to be the New Ark – free from all stain of sin and free from any future sin. This was possible through God’s gift of Prevenient Grace which was given at her conception. Mary burned with God’s grace, purity, and love – gifts that were freely given by God. She, like the burning bush that Moses confronted, was enriched by these gifts and, like a warming fire, softly radiated the grace of God’s love to those around her. The Fathers of the Eastern Catholic Church also agree with this truth and verify it when they address the Mother of God as “the All-Holy” (Panagia) and celebrate her as free from any stain of sin. So, we see that God intervened and did not allow the stain of Original Sin to be passed to Mary. She – as the pure vessel – would receive the redemptive grace of God before the actual Redemption took place. This is logical and filled with common sense. Why would God the Father have His Incarnate Son be conceived in a woman who was tainted by the stain of Original Sin? As the Scriptures state – we do not put new wine into old wineskins. To make a commonplace analogy: would any self respecting surgeon, cook, artist, or musician use soiled instruments as they were healing, creating, or performing a masterpiece in their art? In the year AD 431, at the Council of Ephesus in present day Turkey (attended by over 200 bishops from throughout Christendom), Mary was named Theotokos (the God Bearer) and a model of Christian living. “Mary is truly “Mother of God” since she is the mother of the eternal Son of God made man, who is God Himself.” (Catechism of the Catholic Church, 2nd edition, #509). She is called the New Eve because just as the original Eve brought sin and death into the world, Mary, as the bearer of spiritual life, brought Jesus (the New Adam) into the world. This provided the opportunity for grace, Redemption from Sin, and salvation to impact and transform mankind for all eternity. Since 1964, Mary has been honored as the Mother of the Church. She is called The Mother of the Church because through her free choice she cooperated with God’s plan to be the Mother of God – mother of our Redeemer. As a result of His life, ministry death, and resurrection He was able to transform us into a new people and build a new “arc of salvation” (the Church) for us. By the 700’s the Catholic Church celebrated four major Marian solemnities: the Annunciation (Gabriel’s announcement to Mary that she would be the Mother of the Savior), the Presentation of Mary in the Temple, the Assumption of Mary into Heaven, and the Birthday of Mary. The Immaculate Conception became popular by the tenth century. Saint Bernard of Clairvaux, Saint Louis de Montfort, Pope John Paul II and many other saints of the Church have written extensively on Mary and her role in the Church and in the lives of individuals. The Church teaches that Mary was assumed into heaven with body and soul united. Roman Catholics, Greek Orthodox, Russian Orthodox, and all of the Eastern Rite Catholic Churches DO NOT worship Mary. WORSHIP IS RESERVED FOR GOD ALONE. The Western and Eastern Rites of the Catholic Church pay respect and reverence to Mary but never worship her. The meaning of Our Blessed Mother Mary for us today is that, especially at this time in history, we must remember that she spiritually pleads for mercy on behalf of us before the throne of God. She does this in the same way that a mother would intercede with the father on behalf of her children. She loves us with the love of a true mother – for she sees not only our faults but our inherent goodness, too. Please God that we respond to the graces she has to offer us. Hail Mary, full of grace. The Lord is with you. Blessed are you among women, and blessed is the fruit of your womb, Jesus. Some sources on the concept of Prevenient Grace: “Every time we begin to pray to Jesus it is the Holy Spirit who draws us on the way of prayer by his prevenient grace” (#2670 Catechism of the Catholic Church). “That grace is preceded by no merits. A reward is due to good works, if they are performed; but grace, which is not due, precedes, that they may be done [St. Prosper].” Can. 18. #191 Council of Orange II A.D. 529 (Second Council of Orange). St. Augustine also wrote extensively on the concept of grace; and my Associate Pastor Rev. Joseph R. Upton, also mentioned it in his beautiful sermon for this solemnity’s vigil Mass on December 7, 2012 at St. Francis of Assisi Church in Wakefield, Rhode Island. Special thanks to the blog: http://classicalchristianity.com/category/holyfathers/theotokos-mary/ for the Orthodox sacred icon of Mary and the Child Jesus surrounded by the Burning Bush.